In 2013, Pope Francis reaffirmed that the bones discovered in the Graffitti Wall beneath the Vatican during the excavation begun in 1939 are indeed the relics of St. Peter. Why was this statement necessary, when Pope Paul VI in 1966 had already recognized these bones as St. Peter’s? Find out the untold true story of the Houston oilman who secretly funded the original excavation; the agnostic archeologist who deciphered the inscriptions on the wall where the relics were hidden (and became devoted to St. Peter); and the unpublicized dedication of those who unearthed the long-lost burial place while simultaneously working against the Nazis during World War II. The main character in this sweeping historical narrative is the Church, who for two thousand years struggles through one challenge after another, with individual believers contributing their own brave efforts. 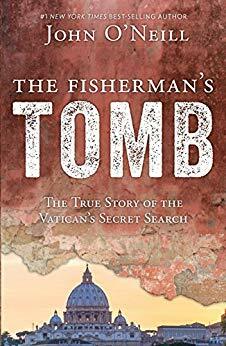 The Fisherman’s Tomb includes fewer technical details about the archaeological dig itself than The Bones of St. Peter, by John Walsh, published in 1982. However, it provides fascinating descriptions of the people who made possible the rediscovery of the burial place, whose location had been completely forgotten. The historical sweep of the book makes clear that both Protestants and Catholics trace their roots back to the tragic beginnings of the Church in Rome, where St. Peter was crucified by Nero, his body dumped on a trash heap. Excavations confirmed what everyone had doubted for centuries, namely, that a series of shrines have stood over this burial place for two thousand years. An eclectic collection of personalities contributed to the rediscovery of the relics, including three Americans who played pivotal roles during the fraught period of Fascist control in Italy. Anyone who loves a good story can enjoy this book. Secular readers will appreciate a well-told, fast-paced narrative that gives due credit to the brilliant agnostic archeologist, Margherita Guarducci. The Vatican asked her in for a week-long consultation: she ended up working on the project for twenty-five years. The Fisherman’s Tomb also provides inspiration and encouragement for those who have been disheartened at revelations of corruption in the Church. This is the other untold story: the extraordinary courage and dedication of believers who gave everything in service to Christ, never seeking any public commendation for their efforts, not just throughout the 20th century, but for hundreds of years before our time. This book is suitable for any reader of English, age 14 or over.